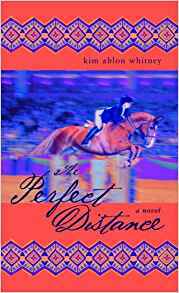 I really enjoyed reading The Perfect Distance. It tells the story of Francie, who rides with a top trainer and is trying to compete at the Maclay Finals in New York. But Francie doesn’t feel like she exactly fits in at the barn where her dad is the barn manager. He’s Mexican and Francie’s mother left when she was very young. I loved this book because first, it is a very well-written story and it kept me interested until the very end. I also liked it because it gave me a little peek into the world of training for a competition like the Maclay - which I would love to do! And the characters were interesting and diverse. Not the usual stuff you read in many horse novels. Note from Sydney’s Mom: I also read Perfect Distance and enjoyed it a great deal. Whitney is an excellent writer. However I will caution that this is a young adult book and discusses some topics that are more appropriate for older girls. Parents should check it out and decide if it is right for their horsecrazy daughters. From about the age of five. I started riding in the summer with family. We all went trail-riding on Cape Cod. After the summer was over, I begged my parents to let me take lessons and from then on all I ever cared about was horses! Did you train and compete like Francie growing up? I started out doing Pony Club and showing in local shows and worked my way up to riding on the A Circuit. Like Francie, I showed in the equitation as a junior. I didn't do quite as well as her, however! I did compete in all the Finals and I got ribbons at the Medal Finals and the USET Finals in my last junior year. What inspired you to write your book, Perfect Distance? Growing up, I devoured any book about horses but at the time there were never any books that were about the A Circuit and doing the equitation that seemed to get it just right. I wanted to write that book! Probably about two years. It was harder than I thought it would be to write. Writing about something you love so much and know so well seemed like it would be easy buy it actually was hard! Read a lot! Reading lots of different books gives me great ideas for my own writing. I'm constantly learning how to write--and how not to write--from books I'm reading. Sadly, I had to put down my old jumper, Courtside, this past fall. He was 23 years old and was happily retired and then got suddenly ill with what we think was heart failure. I've owned a horse since I was ten so it's very strange for me now not to have a horse in my life. I'm hoping to have another horse sometime soon! Why I want to win this book. I want to win this book because I think it will be good. I like books about horses. I am trying to collect all the horse books that I find. And Perfect Distance seems like one of the books that I would like to collect. I have been horse crazy since I was 3 years old. I would absolutely love to read this book! I really want to read this because I'm trying to fit in at the barn I just started at and it also sounds really spectacular. It sounds really good. I'd love to read this as I would like to be a showjumper one day! I love horse books. My three book shelves are over flowing with horse books, why not add a few more? I'm excited to read this book and I think that I would like it because of the premise and the fact that it's not your average horse book. I really like the things the author said as well because it shows that she is a true horse person. They always write the best horse books! You would not believe how much I love this book! The story is so beautiful and inspirational! Thank you Sydney for picking such a great book for your contest! I am so glad you sent me your book to review! It's great. I can't wait to give away the copies you sent in my next contest. So sorry to hear about Courtside. That must have been so hard.